Thank God that rice is one food we Celiacs can eat! I love rice in any form … Long grain, Brown, Basmati, Carnaroli, Vialone Nano, Arborio, Jasmine, Wild … so many to choose from and it is so versatile with so many different recipes that you can conjure up with it! Having said that, Risotto is one of my favorite rice dishes. It is not as difficult as one might imagine. It takes a bit of time to cook as you have to add the stock slowly for a really good risotto. So you will have to stick to your stove till it is ready. You need the right rice for it, best if it is Carnaroli, the ‘King’ or ‘Caviar’ of rice, followed by Vialone Nano. Carnaroli is said to produce the creamiest of Risottos. Arborio is maybe more available, it is not as starchy and absorbs liquid a little less as well than the other two types of rice. Sautee the onion in a large pot over medium heat in a tablespoon of butter and cook until it becomes translucent. Place the stock in a pan and leave it to simmer. Add the rice to the onion in the pot and coat it in the butter, toasting it for about a minute. When the rice becomes opaque, add the wine to the pan, enough to cover the rice, stirring frequently. When the rice has absorbed the wine, add a ladleful of stock to the pan and continue stirring. Continue adding the stock as the rice absorbs it, you want it to almost dry out before adding another ladle. 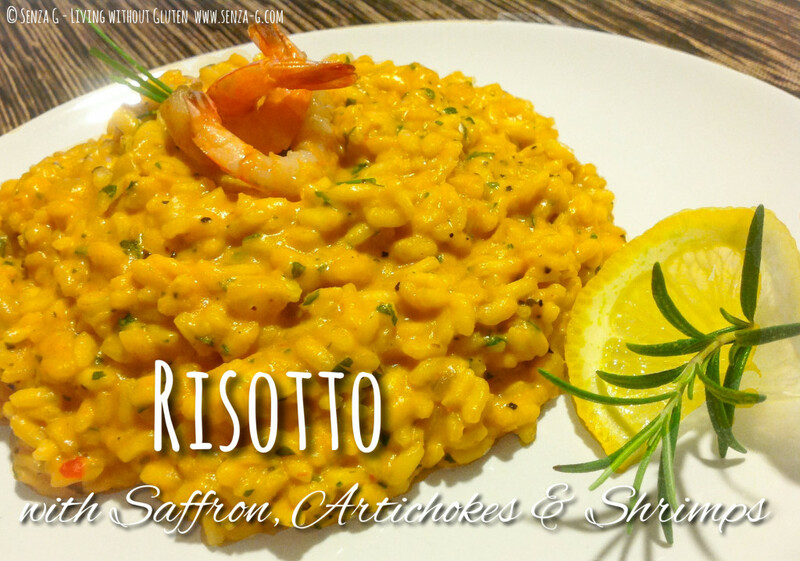 Add the saffron powder to the risotto towards the end of its cooking. When the rice is still quite firm to the bite, add the artichokes and the shrimp and cook for a few more minutes. Do not let the risotto dry up, add a bit more stock. When the rice is ready, it should be al dente, not too soft and not too hard, with just a little bit of liquid. Remove from heat and add the rest of the butter and the chopped parsley, cover and let rest for a couple of minutes before serving. This process is know by the Italians to ‘mantecare’ which means to stir in and briskly mix in the butter and the cheese (not in this case) and then leave it to rest so the end result will be a soft and creamy risotto. Serve garnished with the shrimps.